The plan that I outlined in the last report has gone ahead, the only difference being that the repairs at the North Palace went on for longer, until December 1st, overlapping with the start of the cemetery excavation. The extra time was devoted largely to the casting and laying of the mock-sandstone slabs that filled six of the unusually wide doorways in the central and western animal houses. Our aim this season was to complete the repairs to a major part of the palace, comprising the L-shaped block that includes the best preserved part at the rear, that served as the domestic heart of the palace, and the distinctive set of adjacent animal houses along the north side. In the former, our repairs have mainly been intnded to stabilise the ancient brickwork, leaving as much of it exposed as possible, whereas in the latter, where much of the original brickwork was barely above the ground level, we have recreated the wall lines, but to a diminishing height as one moves away from the rear of the palace. I think that a reasonably harmonious balance has been achieved. Next year, our repair and conservation team will move to the Central City and start work at the front of the Great Aten Temple. The delayed excavation at the South Tombs Cemetery began in mid-November, the first day of actual excavation being the 15th. The archaeological team comprises Anna Stevens, Julie Rogers, Trisha Drennan, Nabil Abd el-Latif Abd el-Hakam and, for part of the time, myself. The El-Minia inspectorate has also supplied three junior inspectors for one month's training in excavation and recording. In past years we have worked in three separate areas of the cemetery. We have called them the Upper Site (begun in 2006), the Lower Site (begun in 2009) and the Wadi Mouth Site (begun in 2010). This time, all resources are going into the last two, and particularly into the Lower Site. Last year's excavation at the Lower Site took the form of a five-metre-wide trench laid down the hill slope, to the edge of the wadi floor. Burials were found down most of its length, except towards the top, where the outcropping of rock at the surface had deterred people from digging graves. At the bottom, the hard gravelly surface at which the grave cuts became visible dropped somewhat, and the graves themselves continued to the very end of the trench. This pointed to the likelihood that not only had graves originally spread across the wadi floor, but that they had, at least to some extent, not been washed away by occasional violent flash floods. It was natural this year, therefore, to extend this same trench out into the wadi floor. A further 25 metres has been added, of which two thirds has had the top layer of sand and gravel removed. Sure enough, the graves continue, and at fairly closely spaced intervals. We realised early on that, along the sides of the wadi, the presence of graves is given away by the scatter of dark broken boulders that were once the original coverings or cairns over the graves. Scattered amongst them are sherds and fragments of bones. On the wadi floor, by contrast, such evidence is only sparsely present, the surface having been swept by floodwaters from time to time. The top layer, around 50 cm deep, is compacted coarse sand and gravel that gives no hint of graves underneath. Yet the graves we have so far uncovered tell the same story of extensive robbery that we have met from the beginning, reinforcing the impression that there has been only one major phase of robbery that happened not too long after the cemetery was in use. The robbers evidently could see where each grave was, and dug down often in a targeted way, leaving parts of the body undisturbed. Within a short time of our starting, the top of another decayed wooden anthropoid coffin appeared, not far from where the two examples were found in 2010. With those, the pieces were removed directly and as carefully as was possible and transferred to the site magazine. This year the team included two conservators, Julie Dawson (Fitzwilliam Musem, Cambridge) and Lucy Skinner. Their first task was to begin consolidation of the 2010 coffin pieces, but the appearance of the new coffin took them immediately into the field to deal with it. The new coffin is, if anything, in an even more fragile condition. Julie and Lucy work with a remarkable first-aid conservation chemical, cyclododecane. When dissolved in warm water and applied to fragile surfaces it forms a firm, opaque white waxy cover that can be reinforced with gauze. The wonder of its properties is that subsequently, when exposed to air, the chemical slowly 'sublimates', in other words, vanishes of its own accord, leaving the wood to be consolidated in the laboratory. It took a week to conserve the coffin in the ground in this way, but at the end, it was possible to lift the sides as single pieces. Wrapped to be airtight, the pieces are in the site magazine awaiting further treatment next year. The site magazine is, in effect, a museum storeroom. It, too, needs money spent on it to create a suitable long-term home for the bulk of the finds from excavation. Its original shelving units were imported from the UK, through the good offices of Alf Baxendale, now one of our trustees. Needing more of them, we have found a blacksmith business in Mallawi (the brothers Adel and Mohammed Anwar Abd el-Rahman) which can produce very reasonable imitations. Members of the Sussex Egyptology Society raised the funds to pay for three units; Jerry Rose and Dolores Burke contributed the cost of the fourth. There is a short-term disadvantage to the method of conservation just outlined: the coffin surfaces are exposed in only small patches before the cyclododecane and gauze are applied, at which time the surfaces become invisible. One only sees the decoration through small and temporary portholes. The sides were decorated in the way that the other coffins were, with vertical columns of hieroglyphs separating striding figures. The hieroglyphs are very faint, so much so that it was not possible to read them in their brief moments of exposure, and they do not show up well on photographs. But one of the windows brought a surprise. The head of one of the striding figures was particularly clear, drawn in thin red paint lines with yellow fill. The head was not human, but unmistakably canine. It could be Anubis or Duamutef, the jackal-headed member of the Four Sons of Horus. Both appear on the sides of coffins during the New Kingdom. Good examples are those of Yuya and Tuyu, the parents of Queen Tiy, from the Valley of the Kings. So far, the decoration of the three coffins found in previous seasons (the first found in 2008) conforms to the Amarna rule (as accepted in modern interpretations) that funerary depictions avoided Osiris and associated deities, including Anubis and the Four Sons of Horus. 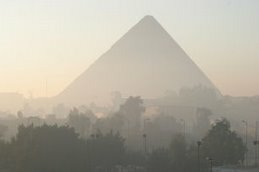 It has never been clear, however, whether this was because Ahenaten ordered it or because it was a logical outcome of people's acceptance of Akhenaten's ideas. Thus, in finding an exception to the rule, we cannot tell if it represents a violation of a royal order, or the retention by one family of older ideas which many of their contemporaries had left behind, the latter implying the not unreasonable existence of a measure of personal choice in such matters. 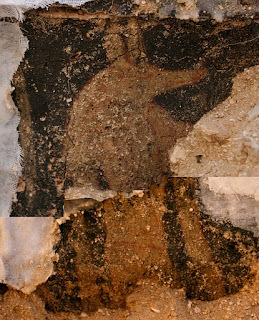 It should be noted that the style of painting, the fine, assured red lines painted over a cream or yellow blocking of the shape, is the same as that on the coffin fragments found in 2008. Both of these coffins, incidentally, also included a single large eye towards the head end of the coffin side. There is no reason, on this basis, to think that this latest coffin was an old one brought to Amarna, having been made before Akhenaten's time. The other figures seemed, whilst momentarily visible before disappearing under their chemical protection, to be human-headed, which is an option for this period. But we will have to wait until at least next year before getting a second and better look. 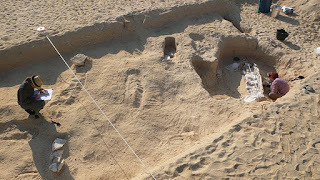 In addition to the trench, other excavation squares are being investigated on the adjacent valley sides, both at the Lower Site and at the Wadi Mouth Site. One by one, graves are being cleared and the bones of their occupants, often children and even babies, are being recovered and often reunited to again become 'individuals', to await study by the anthropologists, who will come in the late spring and tell us more about who the individuals were. Not all of the graves are disturbed but, even so, at the time of writing, apart from the coffin, some sherds and a couple of intact pots, no 'finds' have been discovered, reinforcing the impression that has been there from the beginning, that, either through choice or poverty, adding grave goods to a burial was not a common practice. One consequence is that we are up-to-date in the recording of objects found at the cemetery since we began in 2006. Artist Andy Boyce, at the end of a month of drawing, has put us in this unusual position. The excavation will run until the end of December. It is good to see that, after the upheavals of the spring, the government antiquities agency, now again the Ministry of Antiquities Affairs (its Minister Dr Mohamed Ibrahim Ali), is fulfilling its appointed role. One local result is that our application to renew our programme of work in 2012 has been accepted. I will write about this in a future bulletin. My thanks to all who have helped us through a difficult but none the less interesting year. Barry Kemp, 15 December 2011.